Director: Maya Deren. With Maya Deren, Alexander Hammid, Parker Tyler, John Cage. Screenplay: Maya Deren. Maya Deren was one of the first acknowledged masters of avant-garde film in American cinema, if not the first. She remains one of the best-known, most obviously on the basis of Meshes of the Afternoon, but Deren enthusiasts are justifiably quick to point out the richness and heterogeneity of her styles and interests across her body of work. At Land, Deren's second feature after Meshes, also mirrors the formal recipe of its predecessor most closely, though it's hard to say whether a viewer already primed to Deren's robust vision and boundary-breaking poetics or else a completely fresh audience is more likely to appreciate the second film. 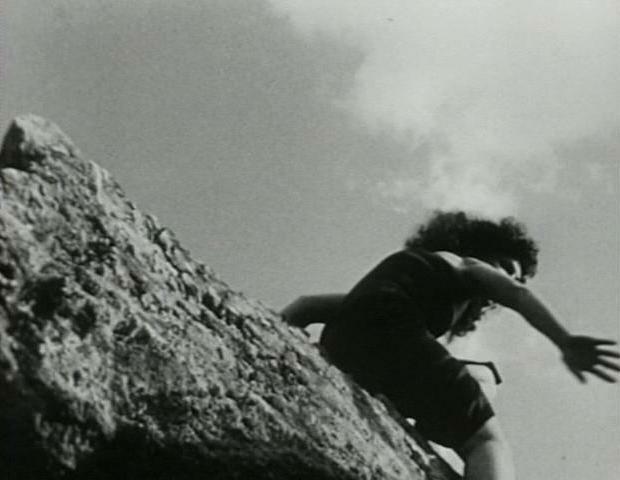 The simple cuts among profoundly dissimilar spaces, each with their own spatial and gravitational logics, mark a clear point of connection between the two, as does the physical pliability of Deren's own body as a key tool for expressing the warping forcefields of her films. Eccentrically but voluptuously beautiful, Deren also uses her ethnic inscrutability to interesting effect in this context, since the persona she adopts for the 14 minutes of At Land functions simultaneously as a washed-up arrivée on this sandy island and as a longterm denizen probing her way toward an exit. Deren's complexion, silhouette, and strong facial features participate in different but comparably interesting ways in both readings, and in an early scene where she crawls on hands and knees down a banquet table crowded with oddly inattentive diners, she literalizes (even as she ironizes) the fascination of her own body as a focal point in her film. If anything, this bent toward literalization accounts for most of the reason why I find At Land a bit less entrancing than Meshes. Though the beach and the tide play important graphic and textural roles near the end of the earlier film, At Land invites a more constant series of associations among femininity, embodiment, oceanic fluidity, tropical fecundity, and terra incognita thus verging much more closely on longstanding and potentially dubious archetypes than the exciting, killing, claustrophobic involutions of Meshes of the Afternoon do, notwithstanding that movie's own flirtations with already-hoary ideas about split feminine egos and hystericizations of the female body and mind. That said, to the extent that it reprises some visual, figural, and grammatical cornerstones of Meshes of the Afternoon, At Land manages to dilate Deren's investigations outward from the cellular trap of one woman's splintering psychospace and into a network of multiple women. The elliptically linked beaches, jungles, interiors, and seascapes of At Land aren't necessarily mirrors or overlays for each other, and nor, I suppose, are the woman or women whom Deren embodies in those locales. Whatever problems of metaphor and connotation are activated by this film, or by the two movies in tandem, At Land opens them outward from the echo-chamber of one freighted persona and into a series of adjacent tableaus where they prompt new sets of questions, even if nothing that At Land "asks" at the level of theme or interpretation is as striking as the sheer impact of Deren curling her body into an S in order to enter a lean-to made of driftwood, or bending upward and against the jagged edges of a felled tree, or sliding her way down a wind-blasted rockface such that her curvaceous form seems just as tough, tense, and durable as the rough surfaces over which she moves.